Taddy was indeed found. When the frog came in the mail this weekend we were a little unsure of how to give it back to him because his original frog was missing an eye and this one was so new and clean. So we decided to just leave the frog on the floor to see if he would recognize it. We called him downstairs and as soon as he saw Taddy his eyes lighted up and the look on his face was priceless. At last his friend came home. He ran to it and instantly called him Taddy. Everything was right in his world again. I am so glad I came across your site when I was combing the Internet for the frog. Your help is very much appreciated. And a BIG THANK YOU to the person who found it on ebay! I am desperately looking for a green stuffed frog that came from a crane machine at Kroger’s. It is a KellyToy frog. We won it for our nephew, Kairu, and it became his best friend. He does everything with him and refuses to sleep without his Taddy. On a trip to the grocery store Taddy was lost. We’ve been looking everywhere to replace him, but cannot find it. 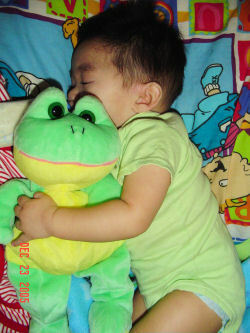 If you can help Angel find this large KELLYTOY frog, THIS SITE IS NO LONGER ACTIVELY MANAGED. Please use Our FREE FACEBOOK GROUP, including #021908-1 in the subject, . Please be sure you use an email address that is correct, and that you will be using for a long time!! I can’t help you if I can’t contact you!! That includes those who post comments with information or requests as Anonymous. Here it is on ebay!! Having fun? Thanks, Tami. I’ve emailed her. I haven’t heard back from her yet, Tami, but I’ll post when I do. I haven’t heard from her yet, but I’ll let you know when I do, Tami.